These Bell Pepper Nachos are everything we love about regular nachos AND they’re much healthier! And the best part, they are super easy to make -check them out. 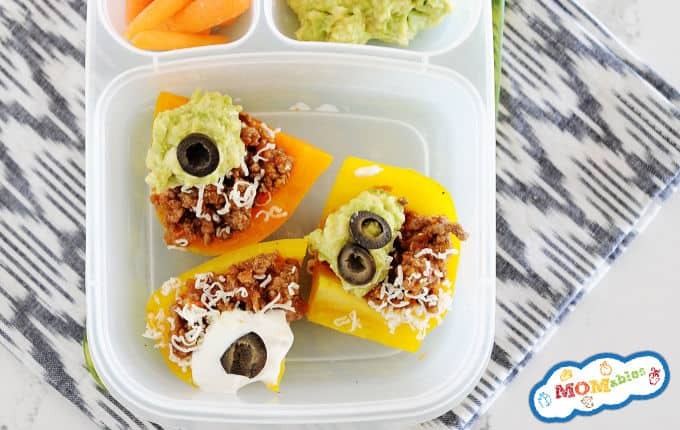 This is one EPIC, low-carb lunch that tastes like you are indulging but is totally good for you since sliced bell peppers replace the usual chips! 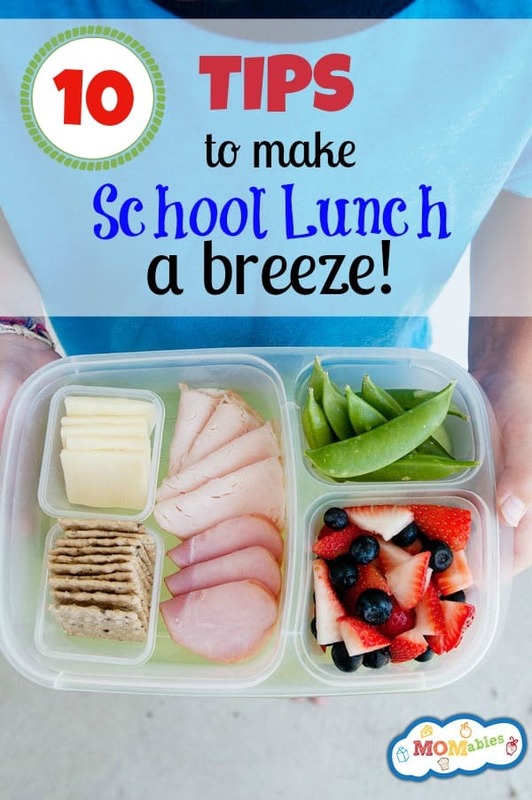 It’s also a great way for the kids eat more veggies in a way that will make them want to clean their plate -or lunchbox in this case. 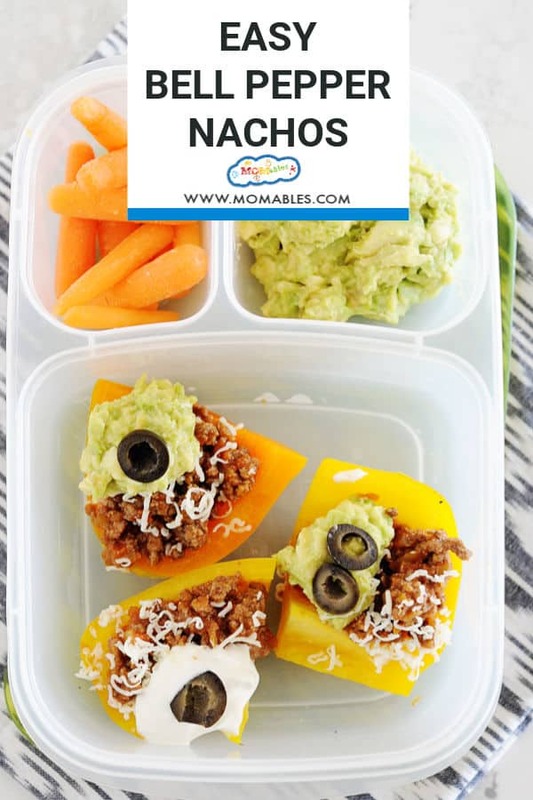 This healthy nacho lunch comes together super fast by using leftover ground taco meat. 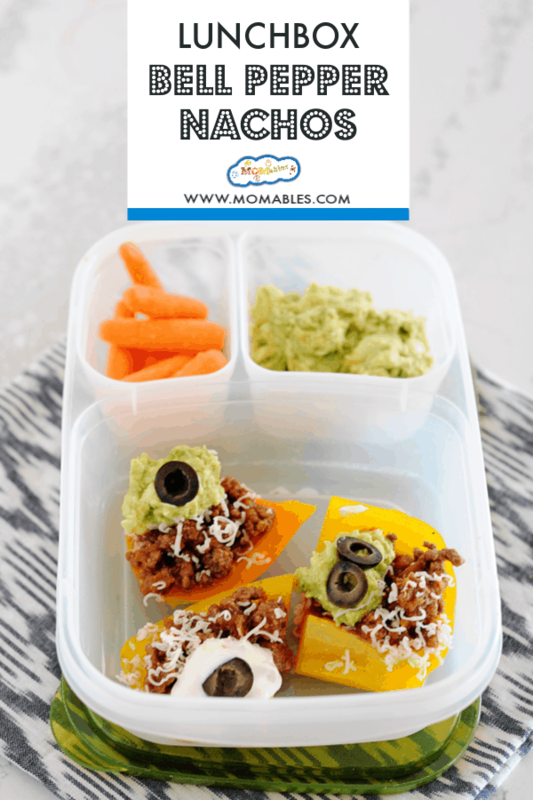 I plan on making tacos one night and use leftover taco meat and all the fixings for this easy lunch recipe! This is a great twist on traditional homemade nachos. After a quick first bake in the oven, you get to load the nacho with all your favorite toppings like cheese, sour cream, salsa, and guacamole! You could say, these nachos are my new favorite thing! Reinventing one meal’s leftovers into another awesome recipe is a part of our weekly MOMables Family-Friendly Meal Plans, routine! This way to you can enjoy a variety of fresh meals and eliminate food waste. 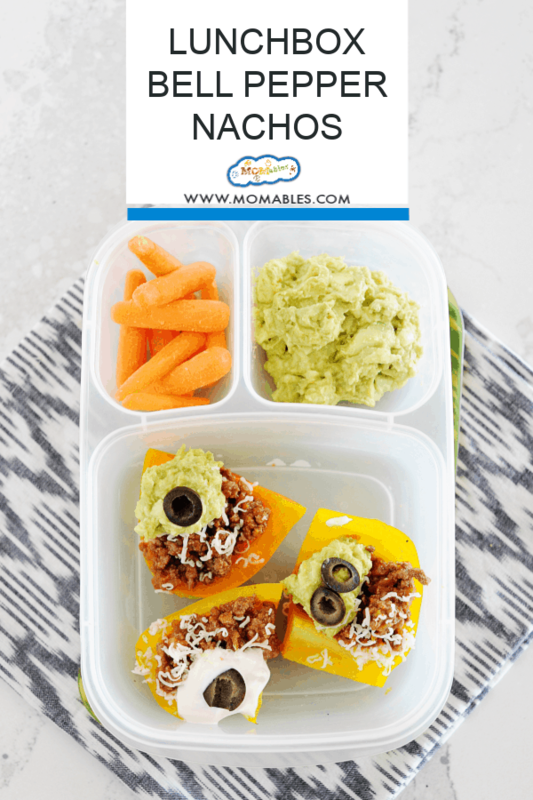 These Bell Pepper Nachos are fun for dinner or even lunch! If making for dinner, plan to prepare a few extra. Pack them for lunch the next day along with the sour cream, guacamole, and salsa in separate sauce containers. If you are wondering how these stay hot in a simple lunch container… they don’t. They are super delicious at room temperature. The pepper doesn’t get soggy at all so they are easy to pick up and eat. Of course, if you want to pack a “hot” meal, you can always layer these hot inside a thermos, close the lid, and enjoy. Fun and nutritious meals like this one can be a challenge to feed our picky eaters, I know. 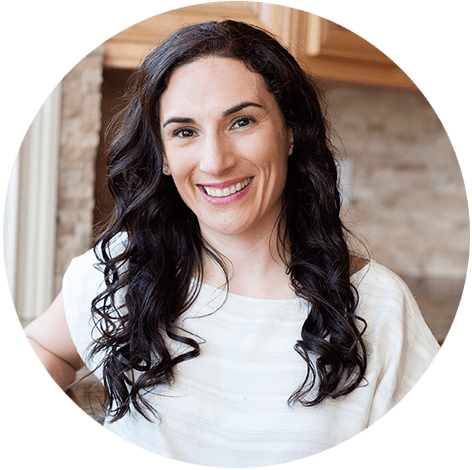 So if it’s a challenge for you as well, check out our picky eaters’ resource section. Preheat oven to 350 degrees. Place oven rack in the middle position and line a large baking sheet with parchment paper. Place the bell pepper slices onto the pan. In a pan over medium heat, heat 1 tablespoon oil. Add in ground beef and taco seasoning, and using a spatula, break up the ground beef as it cooks, until no longer pink, about 8 to 10 minutes. Place the bell pepper slices in the oven for about 5 minutes. Remove from the oven onto the counter and top with meat mixture and salsa. Add the cheese on top, if using, black olives, and any other toppings you want to be heated. Place back into the oven and bake until the cheese is melted about 5 minutes. 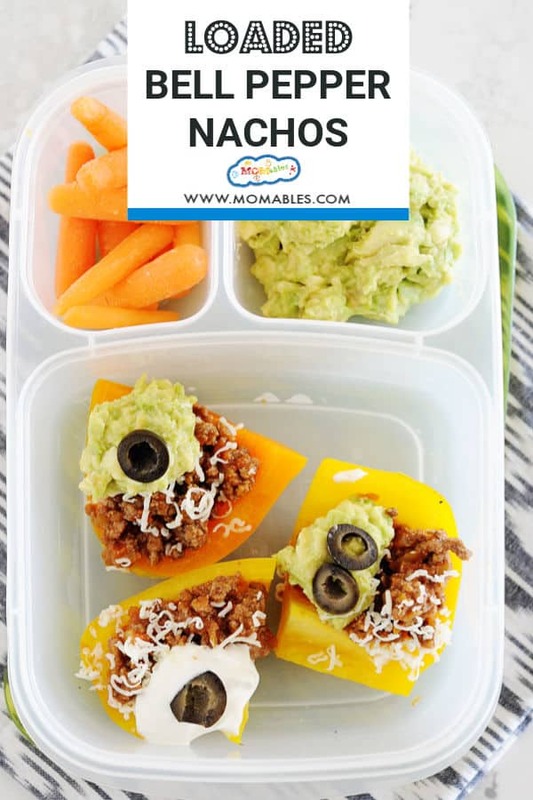 If packing into lunch containers, allow the nachos to cool down to room temperature before packing into lunch containers. Pack the guacamole and sour cream into separate sauce containers. Send with bell pepper nachos.